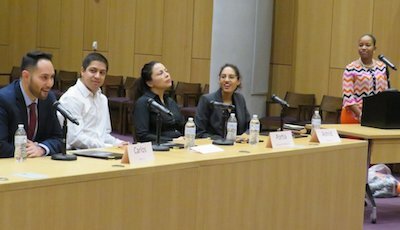 The College of Law's Office of Admissions and Financial Aid hosted Diversity Law Day on Feb. 16, 2018, an event co-sponsored by the New York State Bar Association, Law School Admission Council's DiscoverLaw, New York State Bar Association, and William Herbert Johnson Bar Association. Diversity Law Day brought to Dineen Hall students from Henninger, Nottingham, Elmcrest, and Fowler high schools in Syracuse, as well as from LaFayette, Onondaga Nation, and Utica Proctor high schools. Before a networking lunch, the high school students heard from current Syracuse law students during a panel moderated by 2L Pthara Jeppe and then from young professionals in an Attorney Panel, moderated by Professor Suzette Melendez and featuring Associate Provost for Faculty Affairs LaVonda N. Reed, Professor Paula C. Johnson, Kayla Aria L'15, and Alphonse Williams L'17. After lunch, there was Mock Trial Presentation in the Melanie Gray Ceremonial Courtroom by members of the Syracuse University Undergraduate Mock Trial Team. The high school students not only observed the trial, they participated as members of the jury. The day's closing remarks were given by Director of Externship Programs Kimberly Wolf Price L'03.